Formed in 1988 to reform the educational system of Ladakh, SECMOL today creates opportunities for rural Ladakhi youth, and promotes sustainable living. Their aim is to help present and future generations of Ladakhis benefit from education and adopt a symbiotic relationship with their environment, stalling the impact of global warming and pollution on Ladakh's sensitively balanced ecosystem. The man in the video is Sonam Wangchuk, CNN IBN's Real Indian Hero, Week Magazine's Man of the Year, Ashoka Fellow, Sanctuary Asia' Green Teacher awardee, and the real-life inspiration behind Aamir Khan's character in the Bollywood movie 3 Idiots. He is also the founder of the Students' Educational and Cultural Movement of Ladakh (SECMOL). Through this video, he shares the principles that drive SECMOL's sustainable approach to sanitation, food cultivation, and solar power adoption. Picturesque Ladakh is the eastern part of Jammu and Kashmir - a high-altitude desert on the upper reaches of the Indus river. Its isolated rural society has been greatly impacted by the Indian government's defense and roadways projects that started in the 1960s and the influx of tourists that started in the 1970s. Global warming and the exponential rise in domestic tourism after 2005, however, have had the largest impact on the sensitive ecological balance of this beautiful region. Once, Ladakh depended on its water supply from streams replenished by the melting glaciers - the only source of water in a region that sees almost no rainfall. Global warming has reduced the glacial melt at an alarmingly swift rate. The older Ladakhi generations used water management and sanitation systems that were in harmony with nature - the use of compost pits for sanitation waste meant no drains, sewers, or water was needed. Now, every summer, thousands of tourists crowd the small towns and hotels use flush toilets. In the absence of a sewage system, the sewage water is being let out into streams, polluting the only source of fresh water for the locals. Fuel emissions pollute the clean air, and plastic waste clogs the streams. 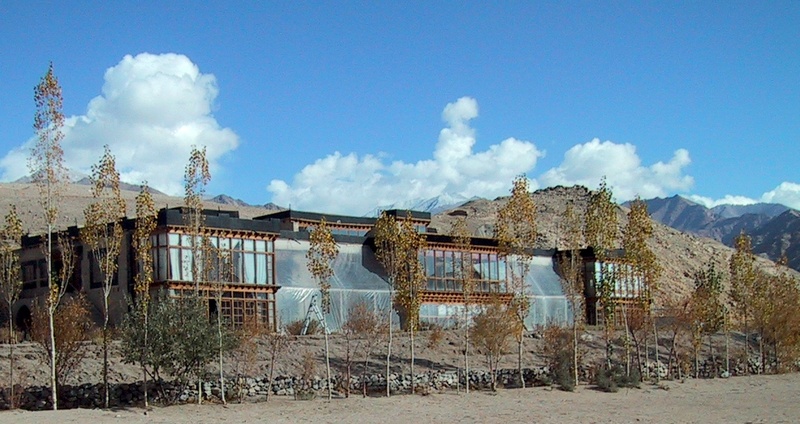 Amidst this deterioration, SECMOL's Phey campus, 18 kilometers from Leh is a small beginning that promotes a sustainable lifestyle in harmony with nature. The campus hosts 40 students and a few volunteers and staff all year round. During workshops, trainings, and youth camps, it can host an additional 100 residents. Developed over 5 years from 1994 to 1999, it has transformed a desert area into a sustainable green oasis with trees, gardens, and animals. The building is built using low-cost, locally available materials and techniques: rammed earth and arched windows that reduced the use of expensive, imported wood. Traditional Ladakhi-style dry composting toilets eliminate the use of flushes. The composted waste serves as manure for their vegetable garden and the 1000+ trees they have planted around the campus. All the buildings on campus are heated through a passive solar design. The bathing blocks have solar heated water, and solar cookers are used in the kitchen eliminating the use of fuel and related emissions. During winters, the buildings are draped in plastic, creating green-houses for the vegetable garden that supplies produce even during the cold Himalayan winters. A solar electric system provides year-round, 24-hour electricity for lighting, TV, computers and tools. The water supply is pumped up from the Indus river using a solar-powered pump. However, a major challenge faced by the campus is its water supply during the summer months. Every summer, the melting glacier water in the Indus river and streams is polluted by an increased release of sewage and garbage. Once the polluted summer waters flow and are pumped up, they bring with them diseases like diarrhea and cholera, and increase energy consumption and water treatment costs. Additionally, the reduced glacial melt and surge in consumption also means a shortage of water during summer. This summer, SECMOL has planned to deal with this problem once and for all. The university has devised an innovative environment friendly design for a solar powered bore-well water pump that will allow the campus to meet its drinking water requirements all year round. Budgeted to cost Rs. 4,00,000, the project has to be completed before June 2015. While the university is raising funds for the project with the support of the Ochre Hearts foundation, work on the project has already commenced. 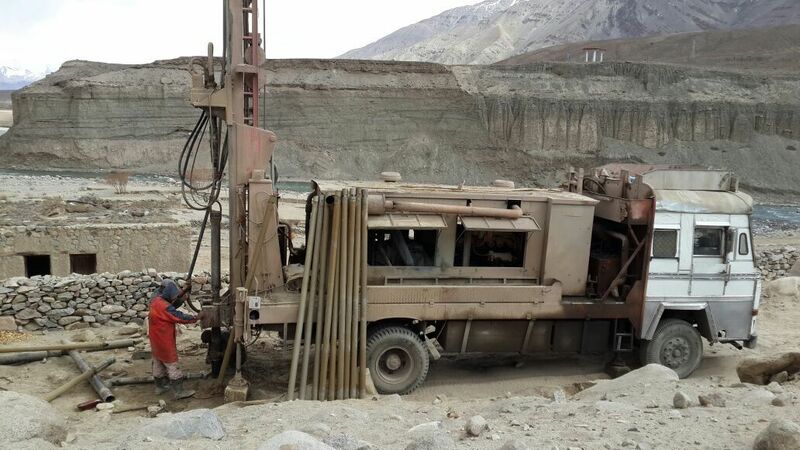 In March 2014, a driller known to SECMOL started drilling for water - he started the work in good faith and is working on credit. 130 feet of drilling later, they finally found water. The bore-well has been dug in the first week of April. Now all that remains is for the funds to come in so SECMOL can pay the driller and build and install the solar-powered mechanism to run the bore-well.